“I’m bored,” said my student. A phrase I hear all too often. “It’s just boring,” he continued indignantly. “Well, if you can’t tell me what’s boring about it, I can’t help you,” I said, playing my next card. “It’s too hard,” he replied. I brought both boys in the group to the wall, where they were able to see a couple of the examples some of my students had already completed. 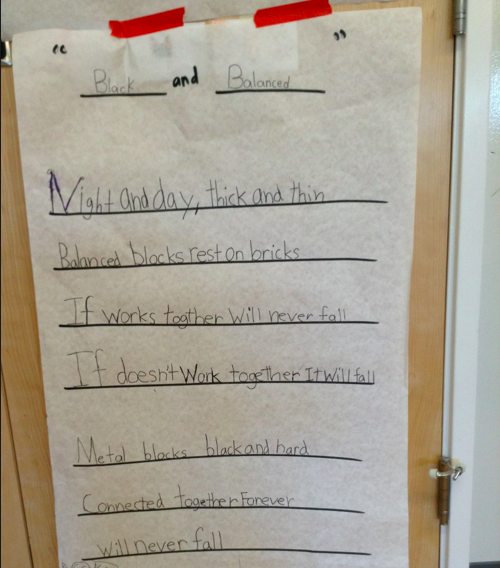 Their assignment was to create a poem in response to the two statues at Washington D.C.’s Holocaust Museum. The first statue was intended to resemble an upside-down black house, while the other was intended to resemble the rebirth after the Holocaust. Of course, my students did not know this. I had withheld the context from them in an effort to keep their minds open. It wasn’t until later in the week that I shared the original intention of the sculpture with them. 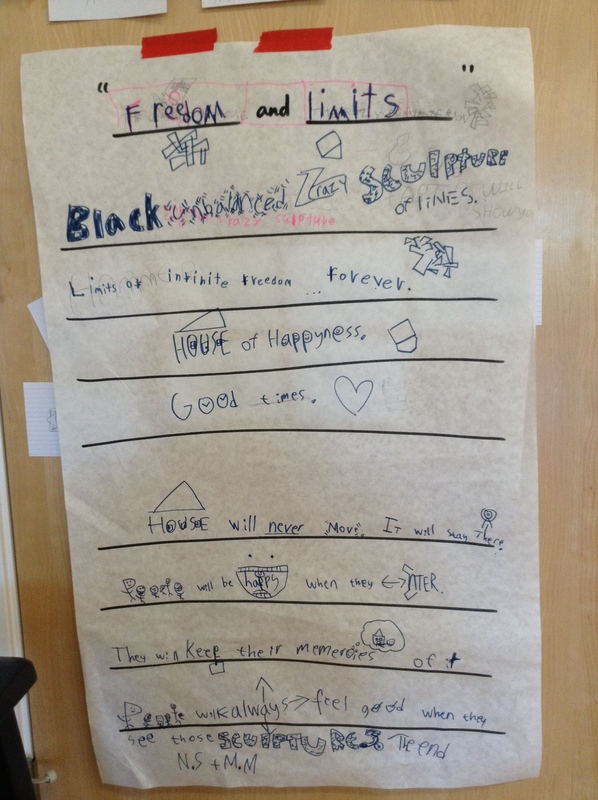 I led them back to their sheet of paper and began to facilitate their poetry writing. They still seemed like they were at a standstill. Their creative juices were not flowing. I stopped, and I wondered about the root of the problem. These were both two very intelligent young boys. Where was the creative block? And then I remembered. Sometimes, a student’s blockage isn’t necessarily there because they don’t know what to do: instead, a student’s blockage comes because they don’t know how to communicate it. Because they can’t find the words. In fact, the difference between a student’s ability to identify and define words versus recall them is quite different. These skills, while complementary, are entirely different. One requires observation and connection, while the other requires long-term memory, articulation, and eloquence. And truth be told, a lot of kids aren’t ready for that. “Black,” the first student said. “Awesome, I can see why you think that,” I said, writing down unbalanced on a Post-it note. It wasn’t long before we had a whole slough of Post-it notes placed in a pile on the paper. By doing this, I had scaffolded the instruction just enough to help them conquer the obstacle of word recall. I didn’t give them the words; I simply gave them a way to get the words out. House will never move. It will stay there. People will be happy when they enter. This would not have been possible had I not given them the tools to get their thoughts out. All too often we accept “I can’t do it” as either failure or giving up, when in reality, it’s just a matter of identifying the blockage and helping our students find their path to the goal. 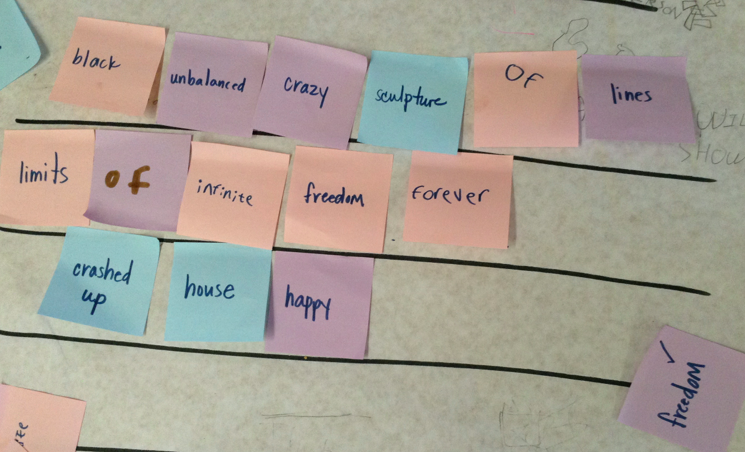 It’s a matter of helping them find their words… and helping them find themselves in the process. Paul, this is brilliant educating! Your student has a bona fide, moving poem, complete with embellishments! You really facilitated a wonderful experience for your students. I bet next time, they will be able to move father along on their poems with this technique and could even collaborate. I love the way you teach, your enthusiasm, and innovation. I am so excited my children will benefit from your educating them at AltSchool in the fall! They were accepted! I am really looking forward to it. Thanks, Paula! I’m so thrilled for you! You’re going to have a great experience! Looking forward to meeting you in person!